Tamaño de esta previsualización: 371 × 600 píxeles. Otras resoluciones: 148 × 240 píxeles · 600 × 970 píxeles. English: Figure 1. 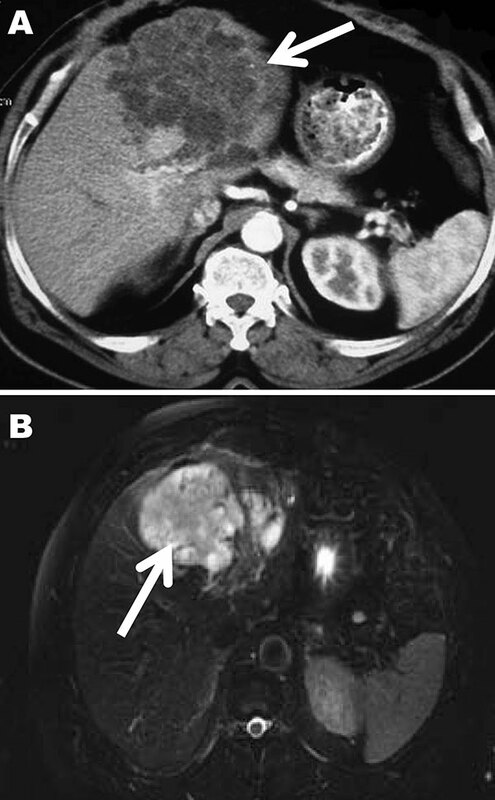 Computed tomography (A) and magnetic resonance (B) images of the liver of a 72-year-old man from French Guiana with polycystic echinococcosis affecting the left side of the liver. White arrows indicate the multicystic liver lesion. The opinions expressed by authors contributing to this journal do not necessarily reflect the opinions of CDC or the institutions with which the authors are affiliated. Emerging Infectious Diseases is published by the Centers for Disease Control and Prevention, a U.S. Government agency. Therefore, all materials published in Emerging Infectious Diseases are in the public domain and can be used without permission. Proper citation, however, is required. Use of trade names is for identification only and does not imply endorsement by the Public Health Service or by the U.S. Department of Health and Human Services.